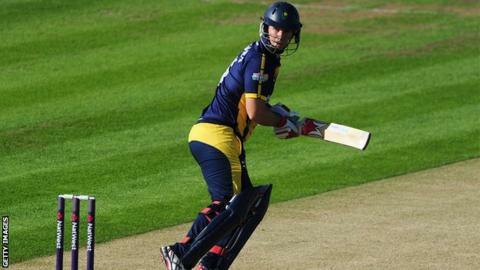 Somerset have signed Australia-born Jim Allenby from Glamorgan, with fellow all-rounder Craig Meschede moving the other way on a season-long loan. The 32-year-old, who is eligible to play for England, has 6,656 runs and 254 first-class wickets to his name. Meschede, 22, only made five County Championship appearances in 2014. "Craig has been brilliant in recognising that a loan to Glamorgan will enable him to play more first team matches than was likely at Somerset next season," said Maynard. Allenby told BBC Radio Wales that his move was prompted by feeling on "slightly different wavelengths" to Glamorgan. He said: "We spoke about different ambitions and plans that the club (Glamorgan) had and I had and it became quite clear that we're on slightly different wavelengths. "I'm 32 so I'm not a young player any more. "But I'm looking to win trophies and play in the most successful style and type of cricket that I can. "As a team I'd love to be playing finals every year and competing for the first division. "So that's something that Somerset are probably just a bit further ahead on there." "Jim is an outstanding player in all formats, a great bloke and a strong character. Whilst not a like-for-like replacement for Nick Compton, I am sure he will play a key part in our success," said Maynard. As well as his first-class pedigree, Allenby also has two T20 centuries to his credit and helped Glamorgan reach the 2013 YB40 final at Lord's. "My aspirations are to win trophies and I am really looking forward to helping Somerset strive to achieve that objective," he told the club website. Glamorgan chief executive Hugh Morris said they were "disappointed" Allenby felt his interests were best served by a move. "It is a shame to see Jim depart, but as we are focused on rebuilding a team capable of consistently competing for domestic honours, we need to have everyone at the club fully committed to bringing success back to the county," he added.